Even before getting pregnant, I knew I wanted to experience all that labour and birth have to offer as my sister in law spoke so warmly about her experiences and said she felt empowered – that she could do anything after it. However, I have heard so many horrific stories from women and men that I knew I needed help to really trust myself and not panic. I came to Sandra’s after hearing Nadia Sawalha’s experience of HypnoBirthing. I chose to take the course because she was immediately enthusiastic, expressed similar ideas to my own and I didn’t feel like ‘just another pregnant woman’. My partner was initially sceptical but after he did his own research, he was soon on board. I found the course helped me to focus on what I wanted and the relaxation materials were an excellent way to facilitate this. I listened to them every day and did the affirmations before I had a bath every night from about 31 weeks. It was a good job because my waters broke three weeks and three days early and I had expected to be over due as a first time mother! Even though my waters had broken, I did not go into active labour and the medical staff advised induction due to risk of infection. HypnoBirthing does not appear to give advice on what to do if you have to be induced so I emailed Sandra whilst in the hospital and she replied immediately, which was very helpful. My partner and I decided to wait for 48 hours and returned to the hospital to be induced on the day I turned 37 weeks. Following an examination I was evaluated as a bad candidate for induction and was 1cm dilated. I tried to concentrate on dealing with the situation and not be too disappointed that I was not having the serene water birth in the birthing centre I had envisioned. I received a peccary at 1pm and began reading the scripts with my partner and kept active. 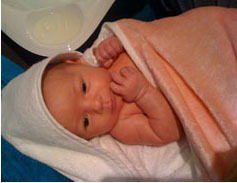 Armed with my birth plan, I asked the midwife not to discuss pain relief with me and they left my partner and I alone. I had been told to expect aches as my cervix softened and had thought I was experiencing that, even though I remember timing the aches, which at one point lasted 30 seconds and were two minutes apart! I never allowed myself to think they were surges as they were manageable with my partner’s massage and use of the birthing ball. I used the visualisation to imagine them as waves crashing over and through me. At 9pm I decided to try and get as close to a water birth as possible and got into the bath! I lost more blood than I was happy with and called for the midwife who told me I’d have to be monitored and needed to get out of the bath. I insisted on being monitored on all fours (!) and was found to be 8cm dilated (the midwife asked me to guess and I guessed I was 3cm so I was happy to find out the aches were surges after all). The monitors recorded the baby’s heart rate was dropping too low following each surge and the midwife called for a consultant. The feeling changed then and I knew I was in transition because my body began to naturally bear down. Due to the drop in heart rate, seven medical staff piled into the room and I had an assisted delivery (ventouse) – everything changed very quickly. I was unable to use the J breath because I was told to push but I almost can’t wait to have another go because it felt natural to do! After two or three pushes, our daughter arrived looking up at me (I delivered back to back in spite of days of scrubbing floors on all fours!) and she was put straight to my chest, which was a moment that was as amazing and unbelievable as I had hoped it would be. Under my wishes, I was given an hour for physiological delivery of the placenta and the helpful midwives gave me a birthing stool but it did not arrive so I ended up having the induction drugs I’d avoided earlier, but it still didn’t show. Nearly four hours after giving birth, I went to theatre with an epidural to have it removed internally, very ironic! The staff were concerned/bemused that my birth plan had not gone to plan but I feel the most crucial part went to plan as I had the full experience I wanted and I’m excited about doing it all again rather than scared or panicked! I believe HypnoBirthing helped my partner and I work together, gave me the tools to be drug free during the surges and face the extra challenges that followed. There is a lack of guidance in HypnoBirthing about how to face induction and I had to work on not feeling like I’d failed by not going into labour naturally or that everything would go out of the window as a result but Sandra helped me with that. I would advise any woman to try the course and use what you learn to your own advantage to take on anything that arises as you give birth. It takes a lot of control to completely surrender! The whole experience was nothing like the horror stories I was told and like my sister in law, I do feel part of something powerful every time I look at my daughter.